This guide covers Tauranga City (including Mount Maunganui and Papamoa) only. For other parts of the Bay of Plenty, please refer to the Zero Waste in the Bay of Plenty homepage. NB: All our regional guides cover as many low-waste options as we could find for food, drink, kitchen and food packaging, cleaning products and bathroom products – scroll down to view each category. At the end of each district section, we also list community groups, council services and ideas for tricky waste streams in each district, so make sure you read down to that part too! Wild Earth Organics, 777 Cameron Road, Tauranga – stocks a range of organic bulk bin dried goods including grains, pulses, nuts, seeds, fruit, flours etc., as well as organic fresh fruit and veges. Heaps of the bulk foods are prepacked though, mostly in plastic. Here’s hoping the bulk bin section will be expanded and the prepacking scaled back. Be Organics, 6 Tawa Street, Mt. Maunganui – stocks a range of organic dried goods including grains, pulses, nuts, seeds, flours, spices and herbs in bulk bins. Huckleberry, 35 MacDonald Street, Mount Maunganui – a range of unpackaged organic dried goods in bulk bins, such as nuts, seeds, grains, dried fruit, flours, sugar and coconut. Bin Inn Papamoa, 30 F Gravatt Road, Fashion Island, Papamoa & Bin Inn Bethlehem, Shop H7, Bethlehem Shopping Centre, Bethlehem, Tauranga – offers a wide array of dried food in bulk (including, but not limited to, nuts, seeds, cereals, grains, flours, and legumes), a range of spices, liquid foods (including vinegars, oils and syrups), sweets and treats, and items essential for zero waste living, such as baking soda, salt and other specialty baking/cooking goods. They also have a peanut butter machine and coffee beans with on-site grinder. All Bin Inn around New Zealand stores are currently offering 5% discount when you bring your own containers! NB that of all the shops with bulk bins in this region, you can’t beat Bin Inn Papamoa on range of items available in bulk bins. However, it’s one of the pricier Bin Inn’s we’ve seen in New Zealand. Some items are cheaper from the bulk aisle at PAK’nSAVE over the road. Quality Food and Spices, two locations: 367 Cameron Road, Tauranga; and 18 Gravatt Road, Papamoa Beach – stocks a wide range of dried goods in bulk bins including spices, grains, pulses, nuts, seeds, flours etc. Choice Food and Spices, 504 Cameron Road, Tauranga – offers a wide range of unpackaged dried food in bulk, including grains, flours, nuts, seeds, legumes, dried fruit, flours and lots of spices. Also stocks sun-dried tomatoes in their bulk bins, a hard-to-find unpackaged item! Spice World, 757 Cameron Road, Tauranga – a huge range of bulk bins stocking flours, grains, legumes, spices, sugars, herbs, spices, condiments, nuts and dried fruit. Malwa Food and Spices, 946 Cameron Road, Gate Pa, Tauranga – stocks a range of bulk bin dried goods including spices, grains, pulses, nuts, seeds, flours etc. Spice, Groceries and Dairy, 143 Greerton Road, Tauranga – stocks a range of bulk bin dried goods including spices, grains, pulses, nuts, seeds, flours etc. Vetro Tauranga, 111 Third Avenue, Tauranga – refills of The Good Oil rapeseed oil available, BYO bottle. Bethlehem Health & Tea Shop, 299c Tauranga West Road, Tauranga – apple cider vinegar refills, BYO bottle. Supermarkets – most supermarkets have bulk bin/pick and mix sections with wholefoods (BYO bags for these). However they’re pretty expensive, often more so than equivalent ingredients in packets (bah! ), and often pricier than the bulk bins at organic stores. But look out for when things in the bulk bin aisle in supermarkets are on special because sometimes you can get a good deal! Doug Jarvis Traditional Butcher, three locations: 56 Devonport Road, Tauranga; 3/2 Owens Place, Mount Maunganui; and Papamoa Plaza, Papamoa – this butcher is super keen for people to BYO containers – the owner has even actively encouraged this on social media – yay! Sanford Seafood Market, 1 Cross Road, Tauranga – good selection of whole and filleted fish, shellfish and other seafood unpackaged – very keen for people to use their own containers. The F & C, 30 Gravatt Road, Papamoa – a small range of fish fillets unpackaged you can get in your own container. PAK’nSAVE Tauriko, 2 Taurikura Drive, Tauranga; and PAK’nSAVE Papamoa, 42 Domain Road, Papamoa Beach – sells whole fish and prawns in a self-serve area – just BYO container and put them straight in to avoid using the plastic bags provided. Unpackaged live mussels – there are a number of stores in Tauranga that stock unpackaged live mussels at self-serve counters. We put them straight into upcycled ice cream containers/BYO containers rather than the plastic bags the stores usually provide. You can find unpackaged live mussels at Bobby’s Fresh Fish Market, 1 Dive Street, Tauranga; Sanford Seafood Market, 1 Cross Road, Tauranga; New World Gate Pā, 948 Gate Pā Shopping Centre, 1000 Cameron Road, Tauranga; New World Brookfield, 89 Bellevue Road, Tauranga; New World Mt Maunganui, corner Tweed Street and Maunganui Road, Mount Maunganui; PAK’nSAVE Tauriko, 2 Taurikura Drive, Tauranga; and PAK’nSAVE Papamoa, 42 Domain Road, Papamoa Beach. Gouda Cheese Shop, corner Cameron Road and Sixth Avenue, Tauranga – BYO container (and beeswax wrap for freshness) to get cheese cut fresh off the round and put straight into your own container. Flaveur Breads, Bakery at 31 Totara Street, Mount Maunganui; Tauranga cafe at 94 Second Avenue, Tauranga – although this store pre-bags their fresh bread in brown paper bags, you can have them take it out and put into your own bag, and they will reuse the paper bag. Make sure you get in early at the Second Ave cafe or else you can only get bread pre-packaged in plastic! Gouda Cheese Shop, corner Cameron Road and Sixth Avenue, Tauranga – sells Volare sourdough bread (from Hamilton) unpackaged – BYO bread bag. Be Organics, 6 Tawa Street, Mount Maunganui – stocks unpackaged loaves of the local Better Bread. Central Deli, 520 Maunganui Road, Mount Maunganui – sells unpackaged loaves of Mount Sourdough Co bread. Bin Inn Papamoa, 30 F Gravatt Road, Fashion Island, Papamoa – fresh unpackaged loaves by Hamilton based artisan sourdough bakery, Volare, available on Wednesdays and Saturdays. Big Bake Bakery, 18 Gravatt Road, Papamoa Beach. Markets – No two ways about it, if you want to get a good source of unpackaged, often locally grown, produce, markets are the place to frequent! By and large, we’ve found that markets, where you can meet the grower/producer face-to-face, are really great for starting fruitful conversations about waste-free food, and developing relationships and systems that enable you to get your favourite fruit, vege and preserves without the packaging. Have a chat to see if you can leave containers with the stall holders for them to fill with your desired product for you to pick up from them the following week, or if the stallholder uses glass jars for packaging, ask whether they will take their empty glass jars back for sterilisation and reuse. There are three farmers’ markets to check out in Tauranga – Tauranga Farmers Market, Tauranga Primary School, 31 Fifth Ave; Mount Mainstreet Farmers’ Market, Phoenix car park, 141 Maunganui Road; and Oropi Sunday Market, Oropi Memorial Hall, 1295 Oropi Road. Co-ops – co-ops can be a great way of getting affordable organics without the packaging. However it’s not always the case that you can bring your own bags and containers for loose goods. Tauranga Co-op is a great option for getting unpackaged organic produce (i.e. fruit and veg), but at this stage you cannot pack dry wholefoods into your own bags and containers as this is all pre-packed. However, you may be able to ask to drop off your bags/containers beforehand, and when they pack they can pack your order into your bags/containers. Always worth asking! Trade Aid – Trade Aid’s 2kg sugar bags are great for upcycling as bulk bin bags and are compostable when they do start to fall apart. Trade Aid’s coconut oil is one of the few on the market that does not have a plastic seal around the lid. You can get these goods at Trade Aid, 3/192 Maunganui Road, Mt. Maunganui. Otherwise, the sugar is sold at Huckleberry, 35 MacDonald Street, Mount Maunganui. Silky Oak Chocolates, Piccadilly Arcade, 43 Devonport Road, Tauranga – a range of truffles and fudge. Cabbages and Kings, 46 Grey Street, Tauranga – chocolate truffles. Point of Difference, 1344 Cameron Road, Tauranga – truffles and English sweets. Health Haven, 85 Bellevue Road, Tauranga – chocolate coated sweets. Gouda Cheese Shop, corner Cameron Road and Sixth Avenue, Tauranga – licorice. Coffee – wherever possible, we encourage people to find places that sell whole or ground coffee beans unpackaged and have them put in BYO bags/containers. Coffee roasters are a great place to start – we love Excelso Coffee Roasters, 112 Third Avenue West, Tauranga who will happily put their excellent coffee beans (or freshly ground) into your own container. They will even accept any old vessel if you want a brew there – one customer even brings in an old glass jar! Other roasteries in Tauranga who will also accept BYO containers for unpackaged beans are Fixation Coffee, 10 Dive Crescent, Tauranga; Fusion Coffee Roasters, 141 Totara St, Mt Maunganui. Other roasters that we haven’t had a chance to approach and ask if they will accept BYO containers for unpakcaged beans (though they probably do) are Little Drum Coffee, 21 Macdonald Street, Mount Maunganui; or Kiwi Espresso, Matapihi. Alternatively, get beans (Trade Aid and Fusion Coffee) whole or ground at Bin Inn Papamoa, 30 F Gravatt Rd, Fashion Island, Papamoa. Furthermore, you can get coffee beans that come in home compostable packaging by Econic – Kōkako, from Wild One Wholefoods Eatery, Prince Ave, Mount Maunganui, and Huckleberry’s own brand in a 1kg bag at Huckleberry, 35 MacDonald Street, Mount Maunganui. Tea – get unpackaged, loose organic tea leaves from Be Organics, 6 Tawa Street, Mount Maunganui. Bin Inn Papamoa, 30 F Gravatt Road, Fashion Island, Papamoa, also stocks a few loose leaf tea varieties in bulk. There are also a few loose leaf tea options at Health Shop & Clinic Greerton, 1301 Cameron Road, Tauranga – they usually sell in 100g amounts so make sure you have an appropriate container for this. You could also look out for Herbal Potential tea, which is available in stockists around Tauranga and Mount Maunganui (see the list of stockists on their website). The tea is packaged in brown paper bags that are home compostable. Milk – Tauranga and Mount Maunganui offer zero waste milk options, a rarity in New Zealand (for now)! There are some milk vending machines where you just BYO bottle to fill up with (these places usually sell reusable glass bottles if you’re just getting started). Fill up with Jersey Girl Organics‘ whole milk (from Cleavedale Farm in Matamata) at Col’s Gourmet Selection, 237 Maunganui Road, Mt. Maunganui (we’ve heard the vending machine at The Fresh Market, 1000 Cameron Road, Tauranga has disappeared – does anyone know about this?) If you prefer raw, unpasteurized milk, you can BYO bottle to Walnut Tree Farm, 512 Welcome Bay Road, Tauranga. Drinking chocolate – get drinking chocolate and cocoa powder in bulk at Bin Inn Papamoa, 30 F Gravatt Road, Fashion Island, Papamoa. Beer – the key to zero waste beer is to bring your own flagons/bottles to stores that sell beer on tap. Breweries are a great place to go – two great options are The Rising Tide, 107 Newton Street, Mt. Maunganui, which is the home for Mount Brewing Co; or The Island Brewery, 20 Domain Road, Papamoa Beach. You can also get Good George beer (Hamilton brewery) on tap at Good Local, 83 Pyes Pa Road, Tauranga – though note you can only use the Good George bottles as they are a particular size. There are also a couple of liquor stores where you can get craft beer on tap, such as Liquorland Tauranga, 395 Cameron Road, Tauranga; Liquorland Otumoetai, 50 Bureta Road, Tauranga; Liquorland Mount Maunganui, 1 Owens Place, or Liquor King Mount Maunganui, 290 Maunganui Road. You can also get classic commercial beer like Speight’s and Lion Red at Super Liquor Greerton, 1235 Cameron Road, Tauranga. Keep an eye out for other places too! Kombucha – locally-made Lucy’s Booch kombucha operates with a bottle return system (bring your empty bottle back and you’ll get a $1 refund, and the bottle will get returned to Lucy’s Booch for sterilisation and refill) – you can get Lucy’s Booch at The Gluten & Allergy Free Shop, 435 Cameron Road, Tauranga. You can also get Organic Mechanic kombucha refills on tap (though you have to use OM bottles) at Huckleberry, 35 MacDonald Street, Mount Maunganui. Say “no more” to disposable takeaway coffee cups and plastic water bottles by getting yourself reusables instead! Get reusable water bottles at Little Trooper, corner Willow and Wharf Street Tauranga; Gourmet Trader, Gate Pa Shopping Centre, 1000 Cameron Road, Tauranga; Mainly Gifts, 6 Cherrywood Drive, Tauranga (metal and glass); Cabbages and Kings, 46 Grey Street, Tauranga; Home Etc., 93 Devonport Road, Tauranga (metal); Options, Bethlehem Shopping Centre, 19 Bethlehem Road, Tauranga (metal); Neche, 187 Maunganui Road, Mount Maunganui (metal and glass); The Gilded Edge, 162 Maunganui Road, Mt. Maunganui (metal and glass); Paper Plane, 99 Maunganui Road, Mt. Maunganui (metal); Pohutukawa Gallery, corner Prince Avenue and Maunganui Road, Mount Maunganui (metal); Huckleberry, 35 MacDonald Street, Mount Maunganui (metal); and Plum Organics, 22 Gravatt Road, Papamoa (metal and glass). Find the Keep Cup brand at Gourmet Trader, Gate Pa Shopping Centre, 1000 Cameron Road, Tauranga; Mediterraneo Cafe, 62 Devonport Road, Tauranga; Loop Deli, corner Hamilton Street and Cameron Road, Tauranga; Excelso Coffee Roasters, 116 3rd Ave, Tauranga; Fusion Coffee Roasters, 141 Totara St, Mt Maunganui; Wild One Wholefoods Eatery, Prince Ave, Mount Maunganui; Huckleberry, 35 MacDonald Street, Mount Maunganui; Double Teaspoons, Papamoa Plaza, Papamoa; and Four14 Espresso, 414 Pyes Pa Road, Tauranga. Havana cups are available at Flaveur Breads Cafe, 94 Second Avenue, Tauranga. You can get glass Joco Cups at The Nourished Eatery, 114 Willow Street, Tauranga; Paddington Store, Our Place container mall, Willow Street, Tauranga; Unichem John’s Photo Pharmacy, corner of Second Avenue and Cameron Road, Tauranga; Mainly Gifts, 6 Cherrywood Drive, Tauranga; Fusion Coffee Roasters, 141 Totara St, Mt Maunganui; Paper Plane, 99 Maunganui Road, Mt. Maunganui; Flux, 277 Maunganui Road, Mount Maunganui; and Bin Inn Papamoa, 30 F Gravatt Road, Fashion Island, Papamoa; Monroes Coffee and Ice Cream, 552 Papamoa Beach Road, Papamoa Beach. Similar to Joco are Sol cups which are sold at Mainly Gifts, 6 Cherrywood Drive, Tauranga and Flux, 277 Maunganui Road, Mount Maunganui. Paper Plane, 99 Maunganui Road, Mt. Maunganui also sells reusable coffee cup lids which you can fit over any appropriate sized cup. Reusable lunch boxes or containers are great to have on you when you’re out and about in case you want to get takeaways, to carry leftovers home with you, or if you find food to forage. You can get Meals in Steel stainless steel lunchboxes and food containers at Huckleberry, 35 MacDonald Street, Mount Maunganui. Plastic shopping bags are a menace, but so too are those plastic produce bags for fruit and vege or the plastic bags often offered alongside bulk bins at bulk stores. You can avoid them by bringing your own bags or buying a set of reusable produce bags. You can get 100% organic cotton produce, bulk bin and string shopping bags at Huckleberry, 35 MacDonald Street, Mount Maunganui (as well as bulk bin bags) and Bin Inn Papamoa, 30 F Gravatt Road, Fashion Island, Papamoa; produce and string bags at Gourmet Trader, Gate Pa Shopping Centre, 1000 Cameron Road, Tauranga, Wild Earth Organics, 777 Cameron Road, Tauranga, Wild One Wholefoods Eatery, Prince Ave, Mount Maunganui, Paper Plane, 99 Maunganui Road, Mt. Maunganui; or just produce bags at Be Organics, 6 Tawa Street, Mount Maunganui and Plum Organics, 22 Gravatt Road, Papamoa. You can also get Rotorua based The Bag Ladies produce bags at The Gilded Edge, 162 Maunganui Road, Mt. Maunganui. Say “no straw thanks” next time you order a drink out and either use your mouth to drink, or get yourself a reusable metal straw instead. If you’re keen on a reusable metal straw, you can get them from Gourmet Trader, Gate Pa Shopping Centre, 1000 Cameron Road, Tauranga; Wild Earth Organics, 777 Cameron Road, Tauranga; Be Organics, 6 Tawa Street, Mount Maunganui; The Gilded Edge, 162 Maunganui Road, Mt. Maunganui; Wild One Wholefoods Eatery, Prince Ave, Mount Maunganui; Paper Plane, 99 Maunganui Road, Mt. Maunganui; Huckleberry, 35 MacDonald Street, Mount Maunganui; Bin Inn Papamoa, 30 F Gravatt Road, Fashion Island, Papamoa; and Plum Organics, 22 Gravatt Road, Papamoa. Beeswax wrap – available at The Gilded Edge, 162 Maunganui Road, Mt. Maunganui; Paper Plane, 99 Maunganui Road, Mt. Maunganui; Bin Inn Papamoa, 30 F Gravatt Road, Fashion Island, Papamoa; and Wild Earth Organics, 777 Cameron Road, Tauranga, which stocks the Bee Wrapt brand which unfortunately comes wrapped in plastic. However, it’s much cheaper to make your own beeswax wraps! You can get fabric offcuts and fat quarters from Bernina Sewing Centre, corner fifth Avenue and Cameron Road, Tauranga; and Robyn’s Cottage, 147 Chadwick Road, Tauranga. Locally sourced unpackaged beeswax is available at Huckleberry, 35 MacDonald Street, Mount Maunganui; and Bin Inn Papamoa, 30 F Gravatt Road, Fashion Island, Papamoa. Silicone pot/bowlcovers – a good option for storing leftovers in a bowl (other than just putting a plate on top!) or as an alternative to tin foil for roasting (as the covers can withstand temperatures of up to 220 degrees and will also keep hot food warm when transporting). You can buy these at Cabbages and Kings, 46 Grey Street, Tauranga; Gourmet Trader, Gate Pa Shopping Centre, 1000 Cameron Road, Tauranga; Options, Bethlehem Shopping Centre, 19 Bethlehem Road, Tauranga; The Gilded Edge, 162 Maunganui Road, Mt. Maunganui; and @cquisitions, Papamoa Plaza, Papamoa. You can find dishbrushes with wooden handles and removable + replaceable, home compostable heads at Paper Plane, 99 Maunganui Road, Mt. Maunganui; Be Organics, 6 Tawa Street, Mount Maunganui; and Bin Inn Papamoa, 30 F Gravatt Road, Fashion Island, Papamoa. Home compostable veggie brushes (which you can use as a handle-less dishbrush) are sold at Be Organics, 6 Tawa Street, Mount Maunganui; Paper Plane, 99 Maunganui Road, Mt. Maunganui; Bin Inn Papamoa, 30 F Gravatt Road, Fashion Island, Papamoa; and Plum Organics, 22 Gravatt Road, Papamoa. Lovely hand-knitted cotton dishcloths (among a wide range of other hand knitted clothes and household items) are sold at Purple Patch, 55 Grey Street, Tauranga. Fancy Bianca Lorenne 100% cotton cloths are available at Paddington Store, Our Place container mall, Willow Street, Tauranga; Cabbages and Kings, 46 Grey Street, Tauranga; Neptunes, 188 Maunganui Road, Mt. Maunganui; Paper Plane, 99 Maunganui Road, Mt. Maunganui. You can get coconut fibre scourers by Safix from Wild Earth Organics, 777 Cameron Road, Tauranga; Huckleberry, 35 MacDonald Street, Mount Maunganui; and Bin Inn Papamoa, 30 F Gravatt Road, Fashion Island, Papamoa. At Be Organics, 6 Tawa Street, Mount Maunganui you can refill your own bottles of Prana+Therapy Essential Oil Sprays here. You can refill a range of Ecostore cleaning products at Huckleberry, 35 MacDonald Street, Mount Maunganui. Bin Inn Papamoa, 30 F Gravatt Rd, Fashion Island, Papamoa – stocks a wide range of both liquid and powdered cleaning products/ingredients you can fill your own bottles and containers with, including soap nuts in bulk. Eco Planet laundry powder comes in a cardboard box with a cardboard scoop – no plastic lining! You can get it from New World Gate Pa, Gate Pa Shopping Centre, 1000 Cameron Road, Tauranga; New World Brookfield, 89 Bellevue Road, Tauranga; New World Mount Maunganui, corner of Maunganui Road and Tweed Street; and PAK’nSAVE Papamoa, 42 Domain Road, Papamoa Beach. Alternatives to plastic clothes pegs – Be Organics, 6 Tawa Street, Mount Maunganui and Huckleberry, 35 MacDonald Street, Mount Maunganui stocks Go Bamboo bamboo clothes pegs. The Gilded Edge, 162 Maunganui Road, Mt. Maunganui stocks Bento Ninja stainless steel clothes pegs. Get yourself some old school wooden clothes pegs from Paper Plane, 99 Maunganui Road, Mt. Maunganui or Bin Inn Papamoa, 30 F Gravatt Rd, Fashion Island, Papamoa. Baking soda – available unpackaged in bulk bins at Spice World, 757 Cameron Road, Tauranga; Choice Food and Spices, 504 Cameron Road, Tauranga; Quality Food and Spices, 367 Cameron Road, Tauranga; and Bin Inn Papamoa, 30 F Gravatt Rd, Fashion Island, Papamoa. Bars of castile soap, which you can use as a base for homemade dishwashing and laundry liquid (see how it works here) – get the Eco-castile brand at Unichem John’s Photo Pharmacy, corner of Second Avenue and Cameron Road, Tauranga. Dr Bronner’s castile bars are available at Wild Earth Organics, 777 Cameron Road, Tauranga; Wild Herbs, 777 Cameron Road; Huckleberry, 35 MacDonald Street, Mount Maunganui; Bin Inn Papamoa, 30 F Gravatt Rd, Fashion Island, Papamoa; and Plum Organics, 22 Gravatt Road, Papamoa. Bamboo toothbrushes – a great alternative to plastic toothbrushes because they have wooden, home compostable handles (though bristles are still plastic and need to be removed from the handle and put in a rubbish bin). You can find bamboo toothbrushes at The Gluten & Allergy Free Shop, 435 Cameron Road, Tauranga; New World Gate Pa, Gate Pa Shopping Centre, 1000 Cameron Road, Tauranga; Wild Earth Organics, 777 Cameron Road, Tauranga; Unichem John’s Photo Pharmacy, corner of Second Avenue and Cameron Road, Tauranga; New World Brookfield, 89 Bellevue Road, Tauranga; Four Square Cherrywood, 52 Cherrywood Drive, Tauranga; PAK’nSAVE Tauriko, 2 Taurikura Drive, Tauranga; Bethlehem Health & Tea Shop, 299c Tauranga West Road, Tauranga; Be Organics, 6 Tawa Street, Mount Maunganui; Mount Pharmacy, 132 Maunganui Road, Mount Maunganui; New World Mount Maunganui, corner of Maunganui Road and Tweed Street; Huckleberry, 35 MacDonald Street, Mount Maunganui; Bin Inn Papamoa, 30 F Gravatt Rd, Fashion Island, Papamoa; Plum Organics, 22 Gravatt Road, Papamoa; My Pharmacy, Papamoa Plaza, Papamoa; or horrendously expensive ones at Paper Plane, 99 Maunganui Road, Mt. Maunganui. Dental Floss – Wild Earth Organics, 777 Cameron Road, Tauranga and Huckleberry, 35 MacDonald Street, Mount Maunganui both stock The Eco Floss in a glass dispenser. The floss is PLA, which is compostable. Sometimes PLA can’t be hard to break down in a home compost but in floss form it is probably OK. This is a good alternative for vegans who may not want to use silk floss. Wild Earth Organics, 777 Cameron Road, Tauranga. A couple of places stock the popular Ethique range which includes shampoo bars, conditioner bars, shaving bars, deodorant bars, moisturiser bars, etc. (all of Ethique‘s bars come in home compostable packaging): Wild Earth Organics, 777 Cameron Road, Tauranga; Unichem Metro Pharmacy, Bethlehem Shopping Centre, 19 Bethlehem Road, Tauranga; Huckleberry, 35 MacDonald Street, Mount Maunganui; Unichem Papamoa Pharmacy, 26 Gravatt Road, Papamoa; Bin Inn Papamoa, 30 F Gravatt Road, Fashion Island, Papamoa; and Plum Organics, 22 Gravatt Road, Papamoa. Paddington Store, Our Place container mall, Willow Street, Tauranga – stocks Fair + Square facial cleansing and body scrub bars that come in a cardboard sleeve. Neche, 187 Maunganui Road, Mount Maunganui – stocks Wouldn’t Know ’em from a Bar of Soap Co shaving and activated charcoal facial cleansing bars. There are zero waste, low cost alternatives to disposable sanitary items like tampons and pads. Menstrual cups are readily available around Tauranga, including at New World Gate Pa, Gate Pa Shopping Centre, 1000 Cameron Road, Tauranga; Wild Earth Organics, 777 Cameron Road, Tauranga; Unichem John’s Photo Pharmacy, corner of Second Avenue and Cameron Road, Tauranga; Health Haven, 85 Bellevue Road, Tauranga; New World Brookfield, 89 Bellevue Road, Tauranga; Unichem Cherrywood Pharmacy, 50 Cherrywood Drive, Tauranga; PAK’nSAVE Tauriko, 2 Taurikura Drive, Tauranga; The Crossing Pharmacy, 2 Taurikura Drive, Tauranga; Bethlehem Health & Tea Shop, 299c Tauranga West Road, Tauranga; Be Organics, 6 Tawa Street, Mount Maunganui; Health 2000, 194 Maunganui Road, Mount Maunganui; New World Mount Maunganui, corner of Maunganui Road and Tweed Street; Huckleberry, 35 MacDonald Street, Mount Maunganui; Bin Inn Papamoa, 30 F Gravatt Road, Fashion Island, Papamoa; Plum Organics, 22 Gravatt Road, Papamoa; and My Pharmacy, Papamoa Plaza, Papamoa. Reusable pads – available at Bin Inn Papamoa, 30 F Gravatt Road, Fashion Island, Papamoa. Avoid plastic shavers that are designed to be disposable and go for 100% metal razors that will last you decades and only require the 100% metal and recyclable blades to be replaced (or sharpened with a leather strop! ), and remember to use a bar of shaving soap instead of shaving foam that comes in an aerosol can (see above) – note, you’ll need a shaving brush to make this work. You can buy razors and replacement blades from Barbershop Co, 79 Devonport Road, Tauranga; Bay Barbers, Piccadilly Arcade, 43 Devonport Road, Tauranga; and Greerton Barber, 1320 Cameron Road, Tauranga (as well as shaving brushes here). You can get shaving brushes from Cabbages and Kings, 46 Grey Street, Tauranga; Unichem Cherrywood Pharmacy, 50 Cherrywood Drive, Tauranga; Unichem John’s Photo Pharmacy, corner of Second Avenue and Cameron Road, Tauranga; Paper Plane, 99 Maunganui Road, Mt. Maunganui. Cotton Buds – Go Bamboo makes home compostable buds so you can avoid the single-use, unrecyclable plastic ones. Get them from The Gluten & Allergy Free Shop, 435 Cameron Road, Tauranga; Be Organics, 6 Tawa Street, Mount Maunganui; Huckleberry, 35 MacDonald Street, Mount Maunganui; Bin Inn Papamoa, 30 F Gravatt Rd, Fashion Island, Papamoa; and Plum Organics, 22 Gravatt Road, Papamoa. Toilet Paper – get Greencane and Smartass toilet paper (both of which are wrapped in home compostable packaging) at Wild Earth Organics, 777 Cameron Road, Tauranga and Huckleberry, 35 MacDonald Street, Mount Maunganui; get just Greencane at Bin Inn Papamoa, 30 F Gravatt Rd, Fashion Island, Papamoa. Baking Soda is an essential ingredient in lots of homemade toiletries such as toothpaste and deodorant, as well as a great general cleaner when teamed up with vinegar. You can get it unpackaged in bulk bins from Spice World, Cameron Road, Tauranga; Choice Food and Spices, 504 Cameron Road, Tauranga; and Quality Food and Spices, 367 Cameron Road, Tauranga. Medicinal ingredients – Health Shop & Clinic Greerton, 1301 Cameron Road, Tauranga stocks a few things like vitamin C powder and bee pollen which could possibly be put into your own jar/container, you just have to arrange with them when they are packing those items. Regional Waste and Recycling Directory – the Bay of Plenty Regional Council has an excellent, user friendly waste and recycling directory on their website. So if you’ve got a hard to recycle item or material, see if you can find a place to recycle it here. Home composting/worm farms/bokashi – Having a composting, worm farm or bokashi bin system at home is the best and cheapest way to deal with your food scraps. If you’d like help setting one up or working out what the best system would be for you, Tauranga City Council runs worm farm workshops (and attendees get a free worm bin to take home!). You could also consider linking up with your local community garden (see below); a great way to pick up some composting skills. Why Waste – Why Waste leases worm farms to businesses and households at a monthly rate. With this service, the customer not only gets a worm farm on their property for their organic waste, but a vermicompost expert from Why Waste will come and look after it for you regularly – hassle free! What a great idea and it means that, rather than someone taking the organic waste ‘away’ for you, the business or household deals with this waste themselves, on their property – magic! Dropping off your food scraps somewhere – If you’d like to break the food down yourself but haven’t got a garden to put into, check if you can drop food scraps off at the compost bin in your local community garden. Alternatively, if you’re struggling to set up a system in your own home, OR if you have space in your compost for others, check out Sharewaste, New Zealand’s nationwide website linking up people with composts with those who don’t! Edible business food waste – food that is still edible that goes to waste is a crying shame. Good Neighbour runs an excellent food rescue programme across Tauranga, rescuing food from businesses that is not good enough to sell, but is still good enough to eat, and redistributing it to social justice organisations who can pass it on to people who need it most. Garden waste/green waste – accepted at the Te Maunga transfer station in Mount Maunganui for a charge. Find more information here. E-waste – electronic waste is the world’s fastest growing waste stream, with huge environmental implications because of the toxins that can be leached from this waste, but also the loss of incredibly precious resources embedded in these items that are not recovered when the waste is dumped in landfill. Rather than throwing you broken electronics out – have you considered trying to get them repaired first? You could pay someone to do it or look out for Repair or Fix-it Cafes where experts donate their time to fix people’s broken items for free at a designated repair event (usually run by community centres, churches or councils). If your electronics really have given up the ghost, rather than chucking them out, take them to be recycled responsibly. The two transfer stations in the district (at Maleme Street in Greerton and at Te Maunga in Mount Maunganui) accept whiteware for recycling, check out the list here. Most are free to recycle but some, such as fridges and freezers, attract a charge. Your best option for e-recycling of computers and other e-waste is Computer Recyclers, 49 Turrett Road, Tauranga, or Information Technology Solutions. Tauranga City Council also partners with RE:MOBILE, a mobile phone recycling project, and has drop-off points across the city, including at the Council’s Willow Street service centre, either of the resource recovery parks at Te Maunga or Maleme Street, and cardboard collection boxes at public libraries in the city centre, Greerton, Papamoa or Mount Maunganui. Scrap metal – there are many scrap metal dealers around Tauranga and Mount Maunganui who accept any quantity of scrap metal (big and small) from residents and industry (will buy the scrap metal off you), including Metal Man Recyclers, 6 Koromiko Street, Tauranga; Scrapman, 37 Maleme Street, Tauranga; Mount Metal Recyclers, 35 Maru Street, Mt. Maunganui; and Metalco Recyclers, 26 Aerodrome Road, Mt Maunganui. Tauranga Zero Wasters – a closed Facebook group for Tauranga locals to share, seek and advocate for waste reduction ideas in the city. A great place to find out about Tauranga specific options and initiatives that can help the community to produce less waste. Much like the nationwide Facebook group Zero Waste in NZ!, only localised – its great to see more and more of these local networks emerging! Environmental Education for Resource Sustainability Trust (EERST) – though operating across the country, EERST’s base is in Tauranga (for which Tauranga should be very proud!). EERST leads the way in providing education to schools, communities and businesses on topics that relate to earth savvy resource usage and waste minimisation. They run a whole host of zero waste programmes and are the creators of the amazing and very popular Paper4Trees project. If your business, school or community group would like to upskill in the areas of zero waste and waste minimisation, getting in touch with EERST would be an excellent place to start! Waste Watchers Ltd – Does your school, business, or workplace need expert, logistical help minimising waste? If yes, get in touch with Waste Watchers Ltd, who offer a whole range of services to “Slim your Bin!” Run by the legendary Marty Hoffart. Crop Swap – At a crop swap, individuals who have veges or seedlings they’ve grown, preserves or baking they’ve made (or similar), or even home-made knitting/crochet (etc.) crafts (anything made or grown by your hands), come together once a fortnight or once a month, to trade their offerings without any money changing hands – all free! Just bring something to share and let the swapping begin! Trading homegrown or home created goodies with friends and locals means you can avoid all that packaging that often comes with a store setting. You can also have friendly chats about how to share goods without the waste. There are crop swaps around Tauranga (keep an eye out for new ones popping up), including this one on the fourth Saturday of each month, from 2pm-3pm. Yay! Sharing Sheds/Community Fruit and Veg Stands – these are stands/shelves in the community where anyone can drop off excess fruit and veg from their garden, and anyone is free to take what’s there, free of charge. The wonderful art of sharing means that excess produce doesn’t go to waste. Furthermore, items can be shared without excessive amounts of packaging. These are popping up around the country. There’s a great wee shelf in Matua, on Percival Avenue. Community gardens/urban planting – community gardens are an excellent way for residents to get kai without packaging, and to learn skills of growing food and setting up composts – both very useful skills for low-waste living. There are some great community gardens around Tauranga and Mount Maunganui – many run by Good Neighbour through their Let’s Get Growing! programme where you can rent a raised garden bed for your use for $20 a month. Community gardens are always looking for volunteers to help out and come along to working bees, so if you are interested in picking up gardening skills, or if you are already a keen gardener and would like to have the opportunity to share your skill with others, consider getting involved with your local community garden. Menzshed – there are Menzsheds throughout the Bay of Plenty, the closest being in Mount Maunganui. Menzshed provides a great opportunity for men of all ages to share tools and a workspace (reducing the wasteful overduplication of these resources) and to pass on skills of woodworking and other trades. Menzsheds frequently offer communities the service of repairing broken items like furniture (at a small cost), work with upcycled material that might otherwise go to waste, and also create bespoke items for community and charitable purposes. Definitely look up your local! Boomerang Bags Tauranga – joining a group that is sewing reusable bags to give out to the community is a great way to learn to sew while helping to reduce plastic bag consumption and these groups are always looking for volunteers (regardless of whether or not you have prior sewing knowledge). Boomerang Bags does this and has taken New Zealand by storm, and there’s a really vibrant Boomerang Bags group in Tauranga that runs sewing bees regularly across the city! 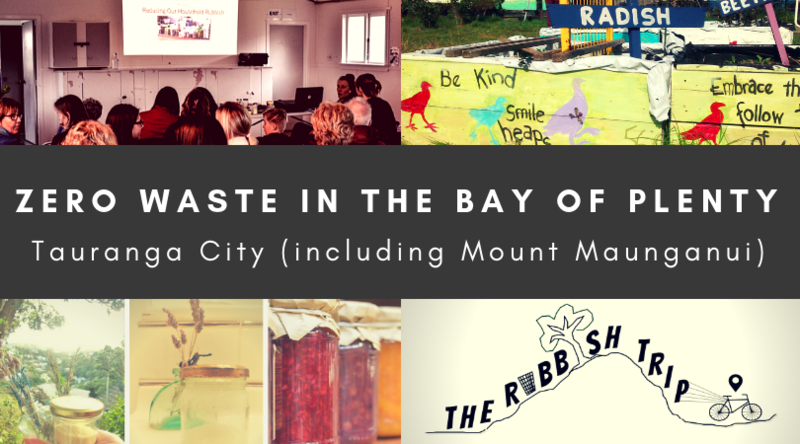 Envirohub Bay of Plenty – Envirohub runs and helps to support a range of workshops and projects, many of which are relevant to waste reduction and low-waste living, all across the Bay of Plenty (though their head office is in Tauranga). So keep your eyes on their website for updates about events and goings-on around you 😀 They also run the Zero Single-use Plastic campaign, a programme that businesses can sign-up to if they wish to pledge to reduce single-use plastics, and Envirohub will offer them support, advice and information on changes they can make. Hi there, a fabulous and comprehensive list of resources, “go to’s” and links. Could we be added? I am involved with 4 organisational ‘hats’; EERST, Paper4trees sells bags made from reused products (seat belts, advertising banners and billboard signs). Keep Tauranga Beautiful (also run by EERST, the not for profit charitable trust). Waste Education NZ LTD – waste minimisation education in schools (Yr1-8) and community education nationwide with workbooks/resources in both english and te reo. Waste Watchers LTD – business waste minimisation consultancy.